If you need an example of how fast fashion has changed the face of clothing retail, then you need look no further than a high-collared dark coat with a ring fastening that went on sale recently at Zara in the US. A month before it hit the racks, it was no more than a vague preference in a customer feedback form. As the Wall Street Journal reports, it can take as little as 25 days for a broad concept–in this case, customers wanting more hardware on their outerwear (that all important ring fixing)–becoming not just a prototype, but an actual product on the racks. The key is that all-important customer feedback, linked to a tightly focussed and centralised production based largely in Zara's home base of Spain. The coat was prototyped in the small industrial city of Arteixo, before a squad of pattern-makers, cutters and seamstresses got to work. A little under two weeks later, 8000 coats were on a plane at Barcelona. Destination: the racks at Zara stores across the States. Other retailers are seeing the benefits to this tightly-integrated and streamlined system. US-based companies are beginning to move operations closer to home, using the Caribbean instead of Asia as manufacturing bases. This squeezes up that all-important transport window, getting new items into the shops much more quickly. However, we have concerns. This fast-track model only works if corners are cut. Can we be certain that QA standards are as high as they could be, given the reputation for fast fashion's poor quality of fit and finish? After all, one reason that the clothes are so cheap is that they are deliberately designed not to last for more than one season. As Zara are redefining the length of a season into weeks rather than months, should we be surprised that clothes from fast fashion retailers don't suit purpose after the first couple of washes? You have to wonder about the design process as well. A five-day window for prototyping seems awfully slim. It makes you wonder if designing for a limited range of sizes is part of the business plan. Zara's parent company Inditex are clearly very successful at what they do, and their business model is envied across the sector. Global communication technology working in concert with a localised and tightly integrated manufacturing base have basically allowed them to redefine the way that clothing is designed, produced and consumed. However, as we all know, the fast-track process and its built-in environmental impact is not necessarily that great for anyone... apart from Inditex's shareholders. Join Breakfast in A Bag on the streets this Christmas! It's a hard life on the streets, and especially at this time of year. The temperature and dark days don't make it pleasant, but Christmas and its focus on family and togetherness can really put the boot in. A new charity aims to make a tiny difference this festive season, with a special push to help the homeless of Central London. Breakfast In A Bag are a highly mission-specific cause who aim to do one thing very well–make sure that those in need get a wholesome and nourishing start to the day. Their breakfast station has been open since the summer. This Christmas Day, they will be out on the streets handing out their signature bags. These include cereal, milk, fruit, juice and a cereal bar–certainly enough to get you up and about. As well as the Christmas Day offensive, Breakfast In A Bag will be throwing a street party next Friday, 18th December. There will be a choir, party hats, mince pies and a few surprises! It'll be worth checking out if you're in town. We like Breakfast In A Bag for their media-savvy approach to raising awareness and funds. You can donate through Paypal, by handing over supermarket vouchers, or even through their Amazon Wishlist. Of course, volunteers are always very welcome! BIAB are also great at reaching out directly for very specific items–they've been after crackers recently, funnily enough. After gaining support from famous names like Al Murray, David Baddiel and Nick Knowles, as well as Labour MP Jess Phillips, the charity's profile and message are getting out to a wide audience. Breakfast In A Bag's inclusive, open approach is making a real difference, and we wish them all the best with their first Christmas on the streets. For more info, and to find out how you can help, hit up the website. It's likely you've already seen this, but just in case it's passed under your radar this week, here's a little Friday film for you. It's one of those shorts that only really becomes an advert in the last five seconds, so don't feel too guilty about enjoying it. After all, 'tis the season of massively expensive Christmas special ads. This one gets a nod as it's directed by Wes Anderson, the symmetry-obsessed guy behind such visual treats as The Grand Budpest Hotel and The Royal Tennenbaums. Here, his sharp visual sense is dialed into a sweet little story of a train delayed on its way to deliver passengers for the holidays, and how the inventive Conductor Ralph does his very best to make things right. With a dry turn from Anderson regular Adrien Brody and a sumptuous mise en scéne (that's set dressing and costumes to you and me), the film is well worth three minutes of your time. I mean, it's no Buster The Bulldog, but it has its moments. Of course, you could question whether the famously fernickety Anderson is bothered that his carefully-tooled aesthetic is being corralled in the services of fast fashion. Or you could just bask in the warm and fuzzy feelings it engenders. Once again, 'tis the season. As an aside, yr humble writer recently changed day jobs, and I'm happy to report that the place I now work for, Cinelab, had a hand in the creation of the film. And I mean film. None of that digital nonsense here, thank you. There. Plug plugged. Enjoy the film. A Beastie Of A Shoe. At Least It's For A Good Cause. There are fascinating examples of fans buying products designed or promoted by their favourite brands or celebrities with little thought given to whether it's worth it. You could argue this goes all the way up to the week-long queues we used to see outside Apple stores for the latest iProduct. When I used to work in London's trendy Soho, I regularly witnessed block-long lines at cult streetwear store Supreme. Famously, once people queued for a Supreme-branded brick. Yep, a regulation-sized house brick stamped with the Supreme logo. All very admirable. Keep are well-known as a highly ethical, worker-supporting company, and Planned Parenthood are an exceptionally worthy cause. However, the problem is in the shoes themselves. They are pretty darn ugly. 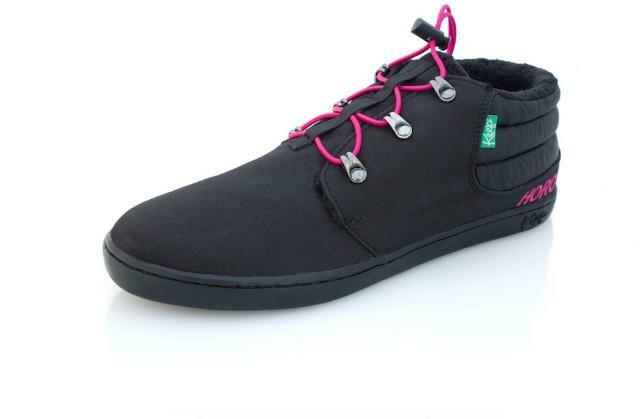 Made of nylon and cordura, with bungees instead of laces, they look more like nan-shoes than anything you'd want to be seen in on the street. Here's the issue, then. Should you buy the shoe, or others like it, if you support a cause or like the endorsing artist, regardless of whether the item itself is unpleasing to the eye? Is this just a matter of taste, and I'm sneering at the Keep X Ad-Rock Ramos simply because they aren't to my taste? I mean, I'm hardly an exemplar of street style. But I fail to see how anyone would want those within safe minimum distance of their feet. Fashion and causes and celebrity endorsements have always been bedfellows, and the resultant offspring have frequently been a bit odd-looking. The Keep X Ad-Rock Ramos is just the latest example of that trend, and they're at least born out of the noblest of intentions. I just hope they're more comfortable than they look. We've finally got through Black Friday and Cyber Monday. Both of these 'holidays' are unadulterated celebrations of greed, as we're encouraged to spend, spend spend. All this on the run-up to Christmas, which is the most commercialised holiday of them all. The message seems clear. The holiday season is all about conspicuous consumption. One small ray of hope is the beacon of Giving Tuesday. It's a chance for you to ease your guilt at the excesses of the weekend just gone, and those to come, by offering up something that can't easily be bought or sold... your precious time. The idea is simple. Pick a cause. Offer to volunteer for a set time. A few hours can make a real difference. There's no time limit, or cut-off date. Donate what time you can, and volunteer when you like. Just show up, and find how simple and fulfilling giving back can be. Last year, last year people from 12 countries came together to donate over 3,500 hours to important causes including refugee empowerment, education and freedom of expression. Let's see if we can improve on that this year. Let's face it, 2016 has been a tough one for all of us. It's little gestures like this that can help us find our way back to the light. If you'd like to join in, look up #GivingTuesday on social media, or head to bitly.com/GivingHours to pledge directly. Why Is It Taking So Long To Make Bangladeshi Garment Factories Safe? Three years after the Rana Plaza disaster, a regulatory body in charge of implementing root-and-branch safety changes in Bangladeshi factories is not doing its job. Worse, it's passing factories as safe when work has yet to be completed. The Guardian has revealed that an independent survey into the factories used by the Alliance consortium, an organisation of retailers that include Gap and Walmart, shows that nearly two-thirds are still not up to code. 62% of factories surveyed have neither working fire alarms or proper fire doors. Nearly half have major structural issues that have not been corrected. The Alliance Consortium has now pushed back a self-imposed deadline to complete the work needed on these factories to 2018–which just happens to coincide with the end of their agreement to carry out that work. There's also contention as to what constitutes completed safety work. The independent survey, undertaken by a group of observers that include the International Labour Rights Forum, the Worker Rights Consortium, the Clean Clothes Campaign and the Maquila Solidarity Network, consider that of the 107 factories considered to be "on track", an astonishing 99 were still falling over on at least one aspect of safety. James does have a point here. The Bangladeshi garment industry is one built quickly on highly questionable safety standards. It's unsurprising that those standards are so low, and building something that will ensure there's no repeat of Rana Plaza should not be cobbled together. Nevertheless, everyone wants results. Should we be concerned that the Alliance seems to be dragging its heels? Or do we take it on faith that doing a good job will take longer than originally anticipated? Sadly, I guess we'll have to wait and see. But as ever, scrutiny and transparency can only help to keep those in charge of worker safety in the Bangladeshi garment industry on their toes and, at least nominally, on schedule. A fascinating sidebar to our earlier post about Black Friday alternatives also ties into concerns about the President-elect of the United States and his views on climate change (although these, like so many of his pre-election stances, seem to be changing by the day). Outdoor clothing retailer Patagonia has been a long-time warrior in the fight against global warming. So they knew that the fight was really on once they heard the news that climate change skeptic Donald Trump was heading for the White House. This Black Friday, Patagonia are taking a stand. They will donate all of their sales generated on that day to grassroots environmental groups. Over 800 organisations across the US are set to benefit from the gesture. And this is not chump change–Patagonia expects to clear over $2million in sales on Black Friday through their 80 stores and online. "Following the election, the idea was generated internally as a way to demonstrate our deep commitment to environmental issues." "During a difficult and divisive time, we felt it was important to go further and connect more of our customers, who love wild places, with those who are fighting tirelessly to protect them." Patagonia's stance can only be applauded, and other companies are already starting to follow suit. These are dangerous times, and it's important that everyone, from the business community to the conscious consumer, makes it clear that Trump's values are not ours. This Black Friday seems like the perfect time to start. One of the few American-style celebrations that hasn't made it across the Atlantic kicks off this week. Understandable, really, when you consider what Thanksgiving commemorates. However, the immediate aftermath of the big November holiday–the commercial gotterdammerung known as Black Friday, has started to gain traction here in the UK. Now, there is an argument that Black Friday deals are a handy money-saver for Christmas presents. But for the most part, it's more a moment for untrammelled consumerist overkill. And frankly, the deals just aren't that great. An increasing number of sustainable retailers and awareness groups are taking a stand against Black Friday, and putting their own twist on proceedings. They're taking the onus off taking, and back onto giving. For example, outdoor eco-retailer United By Blue are launching Blue Friday, and inviting people to use the day wisely–by clearing a pound of trash from shorelines and waterways. By taking a few minutes to fill a trash bag, you'll be doing your bit to help keep the world a slightly more beautiful place. It's also a great way to work off some of that post-turkey bloat. Check out United By Blue's website for more deets on how to contribute, and maybe win a free mug! Meanwhile, Brighton is the place to be for Bright Friday, a day of events and fun that show how the consumerist message can be sidestepped in favour of something a little more sustainable. From textile workshops to a comedy showcase, there really is something for everyone. Bright Friday also marks the launch of Faux, the world's first satirical fashion magazine. This will be rolling out nationwide. Keep an eye on #BrightFriday on all your favourite social media vectors for more info. It's all too easy at this time of year to fall into the consumerist coma and spend, spend, spend... often needlessly. It's worth taking on the advice of Bright Friday and rolling it into your future relationships with the shopping fairies. I don't know about you, but that sounds like a fun blueprint for the retail-heavy weeks ahead. A fascinating article in Magnifeco takes a stern line over an innocuous term - biodegradable. It turns out that the idea of natural materials easily breaking down when returned to the environment is not always the case. A prime example is that of ancient relics, such as a 5,500 year-old shoe found in Armenia in 2010. Made from leather and stuffed with grass, the item is completely organic. Yet here it is, millennia after it was made, still recognisable as a man-made item. They knew how to make 'em to last in those days. When it comes to landfill, things get even more complex. They are specifically designed to keep out the air, water and bacteria that are conducive to biodegradability. In short, it's a great way to stop the process in its tracks. Which means that no matter what your rubbish is made of, in landfill it will stay in good condition for many hundreds of years. Sounds counterintuitive, right? But 'entombing' your trash keeps some of the nasty toxic byproducts of decomposition, a delightful cocktail that scientists call 'leachate', out of groundwater. Everything stays in suspended animation. Safe, but a huge waste of valuable land resources. In short, throwing away clothing is a sure way to keep it in the ecosystem for longer. Always consider recycling or donating, and let your charity of choice decide the best way forward for your unwanted garms. And don't forget, if you follow the Pier mantra of Buy Less, Spend More, Choose Wisely, then you'll be hitting the recycling bins less often anyway. Is Trump An Environmental Nightmare? It's been a week since the shocking rise to the one of the most powerful offices in the world by former reality star and four-time bankrupt Donald Trump. There's a lot of worried people out there that wonder just what shake-ups are in store from the Orange One. No group has more cause to be worried than the environmental lobby. Trump is a well-known climate change denier, claiming that global warming is a conspiracy started by the Chinese. A key promise that got him elected was the pledge to get coal mining restarted in poor rural areas. One of his first moves was to appoint Myron Ewell, a notable contrarian on the issue, as head of the Environmental Protection Agency. Hardly the actions of a man who believes that clean energy is the way forward. How concerned should we be? In the Guardian, Michael Liebreich picks apart the rhetoric, and makes it clear that much of what Trump has claimed is going to happen simply can't. For example, coal is on the decline in the States largely because of the threat from shale gas, which is nearly unlimited and considerably cheaper to extract. As coal reserves become harder to find, we look for alternatives. It's simple economic sense... which as a businessman Trump should be able to understand. Regardless of his views on the EPA (he's referred to the Agency as "a disaster") he can't get rid of it without an Act of Congress, and he simply doesn't have the support there he needs to do that, despite the Republican control of both sides of the house. With regards to clean energy–it's coming, whether Trump and Ewell like it or not. The technology is improving and becoming cheaper year by year. We're already seeing reports of the UK running completely on sustainable power for a few days earlier this year, and this trend is only likely to continue and grow. That growth may be slower without the US leading the way, but there's little he can do to clamp down on it. And of course, there are sound economic reasons for supporting clean renewable energy, regardless of his views on climate change. There's an element of 'wait and see' around the Trump administration, as he comes to realise that promises made on the campaign trail do not automatically translate into policy. We should also note that Donald is not afraid of changing his mind on big issues–as recently as 2009 he co-signed a letter to President Obama extolling the virtues of clean energy. I wonder what's happened to change his mind... and what can be done to change it back. We need to get a handle on waste and sustainability in the fashion industry. Recent figures show that we throw away the equivalent of seven tonnes of unwanted clothing in the UK every ten minutes. The sector takes up five per cent of our carbon and water footprints, and is a massive hog on resources. We need a plan. The thing is, we may just have one. The Waste And Resources Action Plan, better known to us as WRAP, have just signed five major clothing manufacturers to ECAP (European Clothing Action Plan), a Europe-wide initiative to reduce waste and work towards a more sustainable future. One name in particular stands out in the list of participants: Primark. There are four main points to ECAP: designing and specifying products for longer life and closed-loop production; ensuring that less clothing goes to incineration and landfill; encouraging customers to buy less clothing and use it for longer; and improving innovation in resource-efficient design and service models to encourage business growth in the sector. All of these are fairly basic tenets in sustainable fashion. How long have we been talking about Buy Less, Choose Wisely? The plan is for ECAP participants to divert 90,000 tonnes of clothing waste from landfill and incineration, save 1.6 million tons of CO2e, and make 588 million cubic metres of water savings. Help will come in the form of education into the current impact of their business models, and aid in development of new products using more sustainable resources. ECAP aims to build on the success of WRAP's UK-based Sustainable Action Clothing Plan (SCAP2020), which has 82 signatories all working to reduce the environmental impact of the clothing industry. That plan has already had some astonishing successes–in the first year of operation, there was a 12.5% reduction in water impacts, and a 3% drop in carbon emissions. Involving big names in an ambitious plan is great news, of course, but it remains to be seen how much of a success ECAP will be. But the will and enthusiasm to change from both business and government does seem to be in place. And that can only be a good thing. You'll forgive me, I hope, if I take a side-turning today. This tumultuous week has been capped off with the sad news of the passing of Leonard Cohen. A poet, author and song-writer of extraordinary ability, his work inspired romantics, dreamers and beautiful losers for decades. I include myself amongst that throng. His work was, rich, layered and moving, of course. But there was a wry sense of humour there as well. When, in Tower Of Song, he growled "I was born with the gift of a golden voice", you knew this was a man who could never take himself too seriously. Ah, that voice. It's strange listening to early recordings, when he sang in a pleasing contralto. We're more used to later Lenny, when his delivery deepened and sweetly roughened into an instrument of rare, dark gravity. It's almost tactile, the deep bass frequencies washing over you in warm, insistent waves. You can't help but be hypnotised. His songwriting abilities will be forever lauded, but he had a way of using the most unassuming of instruments–cheap keyboards with tinny presets left untouched–to deliver music of true and lasting power. In other hands this would have been laughable. But Lenny always knew what he was doing. The instrumentation is not the song. I was lucky enough to see him in concert once, on one of the tours he undertook after his retirement in a Buddhist enclave in California was ended with the news that his manager had embezzled away his songwriting fortune. What could have been a dreadful chore for all involved was, instead, a truly joyful evening. Lenny was energised, powered by an adoring crowd into a three-hour set that became increasingly the norm. He was in his late seventies at the time, performing with the stamina of a man half his age. I've always said when I grow up that I want to be Leonard Cohen. Now he's gone, I realise what a foolish notion that is. No-one else could be who he was, or do what he did. He was tenacious enough to hold on and deliver one last album, a meditation on mortality called You Want It Darker. One last gift for us. But then, he was always a gentleman that way. I've talked a lot over the past couple of months about ocean plastic, and how it's a great untapped resource waiting to happen. As new technologies develop around fibres and fabrics made from recycled petrochemical products, it becomes clearer that the island of junk floating somewhere in the Pacific could soon have miners descending on it like vultures. The starting shot for that race might just have been fired. Sportswear giant Adidas, have, as I reported a few months back, teamed up with environmental initiative Parley For The Oceans to create a new shoe sourced almost entirely from ocean plastics. The uppers, normally made with synthetic fibres, have instead been woven from recycled plastic yarn. Meanwhile the midsoles have been 3-D printed from recycled fishing nets, one of the biggest problems in the creation of ocean junk. All of which would be admirable. However, this is no limited edition vanity rollout, designed to make Adidas look good. The AdidasxParley shoe is reported to have a million-pair manufacture cycle. The plan is to get these shoes onto as many feet as possible, and prove that scaled-up sustainable fashion manufacture can work and be profitable. More importantly, that the shoes look good and feel comfortable. That shouldn't be too tricky. Let's face it–athletic footwear is mostly plastic these days anyway. Who cares where it comes from? In a clever move, Adidas and Parley are also aiming to make ocean plastic-derived athletic wear a desirable item. They've launched football jerseys for AC Milan and Bayern Munich made from the stuff, that will be featured in special upcoming matches. That's going to get fans salivating, and spike up demand. This is smart marketing, and really good news for the future exploitation of ocean plastics. Passionate football supporters will want these shirts, and will be prepared to listen to the story behind them. I think AdidasxParley may have just played a blinder. For more, head to the Adidas site. I'm never less than amazed by the bounty we receive from the oceans, or the innovative ways in which we find use for the most unassuming of resources. We'll talk more about ocean plastics tomorrow, but today I want to highlight a fantastic example of lateral thinking. Jellyfish are becoming a real problem along some American shorelines, as populations rise, driven by pollution and rising ocean temperatures. They're unpleasant to be around, but jellyfish are also a risk to undersea infrastructure, particularly the cooling systems of nuclear power plants. In some areas of New Mexican coastline, colonies can reach for a hundred miles and be so dense that there are more jellyfish than water in some small inlets. Research into ways to stem that growth have led to some fascinating discoveries. As with ocean plastics, one group of scientists have found a way to turn a problem into something useful. An Israeli startup, Cine'al, has been looking into the water-absorbent properties of jellyfish flesh. When broken down into a material that they call 'hydromash', it is incredibly hygroscopic, able to soak up astonishingly high volumes of liquid. The Cine'al team realised that hydromash could be used in medical dressings, sponges, nappies and tampons. Products like nappies and tampons are invisible yet essential parts of our everyday life, seen for the most part as one-use, disposable items. Any innovation that gets the truckfuls of these materials out of landfill more quickly has to be celebrated. If at the same time it makes our shorelines a little safer and more pleasurable, than so much the better. For more on Cine'al's innovative approach, hit up their website. After yesterday's piece on Syrian refugees toiling for next-to-nothing in factories that supply Marks And Spencer, you could be forgiven for taking a bleak view on how we treat the workers that make our clothes. Child labour and slavery don't seem to be going away, and there seems to be little political will to do anything about it. Ah, but that's where you're wrong. In fact, the signing into law of the Modern Slavery Act in 2015 has had a big impact in the commercial sector. In fact, there's been a huge uptick in big brands and companies that have become actively involved in addressing slavery in the global supply chain since last year. The benefits, according to a survey led by the Ethical Trading Initiative (ETI) on the first anniversary of the Bill coming into force, are clear. 97% of interviewees see the reputational risk of finding modern slavery in the supply chain as the biggest driver for change. 86% see corporate action on human rights as a critical business responsibility, whether or not it's seen as a problem for their image. There's a clear and consistent desire to keep the taint of slavery out of the modern workplace. But there are challenges, which the interviewees also highlighted. Sheer scale is an issue, as are the organisational mountains to climb in simply getting these practices written, formalised and into place. There's a reason so few companies have explicit anti-slavery policies in place–no-one likes to feel that there should be a need for them in the 21st century. The biggest driver behind success in eradicating modern slavery in the developing world is one of the simplest–good, clear communication with your workforce. Due diligence on core labour standards is vitally important, as are close ties with relevant government agencies and NGOs. But all respondents agreed that one of the most effective interventions is involving workers directly in managing and mitigating the risks of modern slavery. There's still some wariness in the management class in dealing with trade unions, however, with only a third of interviewees agreeing that they are an important part of the picture. Most importantly, the survey reveals a significant change in both viewpoint and sense of responsibility. In short, the respondents are no longer looking at modern slavery as someone else's problem. This is a massive step forward in combatting workplace slavery. It's still early days, and no-one is pretending that there isn't a great deal of hard work ahead. But the will is there, and that's what will get things moving. Shocking news came out last week which conflated two of the big issues of our age: child labour and Syrian refugees. More worryingly, it also concerned one of most beloved, and supposedly ethical retailers–Marks And Sparks. “Ethical trading is fundamental to M&S. We are acutely aware of the complexity surrounding Syrian refugees in Turkey. We have a local team on the ground in Turkey who have visited all of our suppliers there. They have also run supplier workshops on the Syrian refugee crisis highlighting the change in labour law and how to legally employ Syrian workers. The issue with a global supply chain is the difficulty in successfully monitoring and policing it. If a big order comes into a factory that urgently needs to be filled, it's easy to see how a factory owner might use all resources available to get the job done, however unethical it might be. Turning a blind eye as to where their agency labour is coming from could be seen as a necessary evil. It's a worry that the big brands seem to find it so difficult to ensure that this sort of behaviour does not happen in their factories. However, short of constant, unannounced inspections, it's tough to see how they can maintain the standards set out in their fair working practices handbooks. Sadly, unethical labour has always been a part of the rag trade, and globalisation makes fair trade all the more difficult to develop and protect. Despite their best efforts, no-one is spotlessly clean in this game. As M&S have found out, an ethical standpoint often collapses when it comes to closer investigation. For more on the story, check out this piece in The Independent. With Halloween behind us, I think we can really feel the weather deepening into autumn. There's a properly frosty chill in the air. All of a sudden, the warm clothes are starting to move to the front of the wardrobe. It's a great time of year to get knitting, if you have the skill–or even if you feel now it's time to learn. If you need a new pair of gloves or a nice scarf, or know someone that could do with them, then the inspiration is right there outside your window. The Big Issue are hoping to tap into some of that creative energy this November, as they launch The Big Knitathon. They hope to raise funds from crafty folk to help out their vendors, who need to keep warm as the temperature drops. Over the next month, you can set up events like knit-ins, or simply form a knitting circle to sell or raffle off goods. The Big Issue have a pack to help you get going, including knitting patterns, a collection box and even balloons! They're also teaming up with Hobbycraft, who will be opening up their stores across the country on November 12th for a huge event day. It's going to be a big one! "We found every free minute was taken up with knitting and the more we did it the more our passion for knitting was re-ignited. It was brilliant how much our nearest and dearest embraced our knitted goods and we were able to witness first hand the joy and warmth that handmade goods can give to others. We hope the money raised will go a little way to bring warmth to others." For more information on the Big Knitathon, and to register for the Hobbycraft event on the 12th, get over to the Big Issue website. Needles at the ready, folks. Let's warm things up this November! This Halloween, Do More With Your Pumpkins! I'm going a little off-piste today, but there's an environmental message to deliver, so I hope you can bear with me just this once. We're coming up on Halloween! For spooky-minded folk like myself, and indeed for millions of other people that break out the witch outfits and cobwebs once a year, it's a real fun time. But won't somebody please think about the pumpkins? Sure, pumpkin-carving is a big part of Halloween-time. It's important to get your jack-o-lanterns out there. But it's not so much fun when you realise just how much needless waste is generated from all that knife action every year. The problem is that people do their carving and then just throw away the flesh! Here's a dose of Halloween horror for you: 18,000 tons of edible pumpkin is simply thrown in the bin every October. It's a real shame. Pumpkin is delicious in soups, roasted, as mash, or in any number of delicious recipes. It's nutritious, cheap and incredibly versatile. That's why our pals at Hubbub have set up Pumpkin Rescue. Started in 2014, it's an attempt to let people know that there's so much that they can do with all that tasty orange goodness. They're running guides so you can set up your own Rescue event, from a carve-and-eat party to a giant pumpkin festival! Here at The Pier we fully support any initiative that gets us eating more of this cheap, easy-to-grow and versatile vegetable. Great pumpkin recipes are only a click away on the internet, so there's really no excuse. This Halloween weekend, get some pumpkin on the table! For more ideas, check out Hubbub's Pumpkin Rescue page. We Brits like to believe that we're charitable souls. Look at the sponsored events we give to so generously, or the way we're happy to dress up in silly costumes for a day to raise money for Comic Relief. But where do we stand amidst the rest of the world when it comes to generosity? The new World Giving Index has just been released, and it makes for interesting reading. The Charities Aid Foundation (CAF) has gathered data from pollsters Gallup to open a window into the world of charitable giving. And the end result shows that Britain needs to up its game a little. The metrics are based on three fundamental strands: donations, volunteering, and helping strangers. In one of those regards, we're doing well–seventh overall. But for acts of charity that require more than just popping a quid into a collection box, we're lagging behind countries like Turkmenistan and Myanmar. Figures released by Gallup show that we're giving slightly less to charities, in fact, while figures for volunteering and what's called 'informal' volunteering (helping someone that isn't a relative without direct guidance from a charity) are stable or slightly up. Which is encouraging, but not a cause for major celebration. As it turns out, our high standing in charitable donations makes the UK the most generous nation in Europe. However, we're part of a downward trend in charity action across the West. Meanwhile, Africa is the continent to watch, with a big rise in giving sparked by disaster relief. Nepal, Libya and Iraq all feature strongly in CAF's good books. Should we be worried that we're becoming less likely to donate or volunteer? Not necessarily. Experts are careful to look at the figures as showing a stable rather than flatlining situation. We should hope that continues or improves. With a steep drop in UK government grants and subsidies, the sector is increasingly reliant on individual donations to be able to keep doing their good work. I know sometimes I talk about ethics in fashion as if it's a simple and straightforward concept that everyone should understand. Let's face it: I've been doing this for so long now that it seems like an obvious thing to me. It's about the environment. It's about respect for the creatures and plants that provide our clothes. Above all, it's about the people who make our clothes. It's always worth revisiting the ol' mission statement, just to be sure everyone's on the same page. As part of Fair Trade Month, Shamini Dhana of Dhana Inc. puts the whole notion under the microscope, and comes up with a pretty solid breakdown. "Where is the connection and conversation today between the end customer and the people behind the scenes who make the products we consume daily?" This has become an important question for those of us involved in ethical fashion. There are 60 million garment workers around the globe, 80 percent of them women. That's a fairly significant portion of humankind. And yet we know so little about them–how they are treated and paid. There's a fundamental disconnect in our heads between the people that make our clothes and the items themselves. However, this chasm is closing. People are starting to ask questions of the brands that populate our high streets. Those that choose to respond are tapping into a growing worldwide movement that wants to see the garment workers of the world treated with respect. Involvement in this movement can be as simple as asking a few questions of your favourite brands. Who made my clothes? Do they receive a fair or living wage? How safe are their working conditions? If your brands can't answer those questions, then the immediate follow up is simply "Why can't you tell me?" A brand that's transparent about the people who make their clothes has nothing to hide about the way they are treated. Brands like H&M and M&S regularly make a big fuss about their ethical treatment of workers, but it's all to easy to slip. As consumers, we have the right to know where our clothes are coming from, and how they are made. It's important to keep the high street on track for an ethical future. All it takes are a few little questions. For more on Shamani's new incentive on listening to the unheard worker, check out this piece on Fair Trade America. Was anyone surprised by the revelations about the way Sports Direct treats its staff? Well, no, but even so, the revelations of monitored toilet breaks, harassment and medical emergencies on the packing lines brought on by overwork were still shocking. The news has left many of us wondering whether there are better, more ethical alternatives to the active-wear giant. Sadly, according to a report by Ethical Consumer, high street sports apparel retailers are not doing their best by the people that work for them, or the environment. An assessment based on sustainability basics like supply chain transparency, worker rights and and environmental reporting led to a pretty poor showing. In fact, the highest they could score any well-known store was a measly 9 out of 20, shared equally between Intersport and Trespass. None of the stores surveyed could offer a clear supply chain policy, with the knock-on effect that none could hold that supply chain to account. Worse, only one brand, Decathlon, could confirm that they don't use zero-hour contracts. Go Outdoors openly advertise them, despite the fact that Sports Direct were heavily criticised for their use. Activewear chains seem genuinely clueless on environmental concerns as well, with no clear policy in place for lessening the use of toxic chemicals in their products or avoiding ranges that involve the use of animal cruelty (like merino for base layers, for example). Only Decathlon had any sort of plan for softening the environmental impact of their stores. Silence from every other brand. Your best bet, Ethical Consumer concludes, is to stay off the high street altogether if you want to shop ethically for your sportswear. Brands like Yew and Páramo offer great alternatives to the big brands with a properly sustainable outlook. It's sad to think that so many of our big stores seem to care so little about ethical concerns. Until they start paying attention, it's best for those of us in the know to take our business elsewhere. After a, let's say challenging, year for the Third Sector, there are some radical rethinks going on about the whole nature of charities in the 21st century. No-one doubts that they have a big role to play. The big question is how they position and sell themselves in the Britain of the future. Or even, how many of them there should be. "I think the word charity is very unhelpful, actually. I think we have a problem with terminology, because the problem is that when the Daily Mail attacks it uses the word charity, but the future is about values-led organisations, both small and large." Take note of the phrase 'values-led organisations', because it'll start to pop up a lot over the next year or so. Mike's right, of course. People view the idea of 'a charity' dimly, while at the same time they're more than happy to fund-raise or volunteer for a cause. Just look at the success of JustGiving. The end result remains the same, but the terminology changes. Although to me, the term 'value-led organisation' is clunky in the extreme. "There are far too many of us charities, in my view, but we do need to create movements and make a difference through getting organised, and sometimes you do need organisations to do that." "broaden alliances and collaboration to achieve as much impact as we possibly can". Now, that's a tricky one. The obvious inference to take from that would be that the head of one of the country's biggest charities is looking to make a landgrab on causes that are smaller and less able to cope with bumps in revenue. Callous, or simply realistic? David Robinson, of Community Links is even more blunt about how the charitable sector needs to reinvent itself. "Is there a role for charities in the future? No, I don’t think so – not specifically. "I think there is a role for values-led organisations, and I think we have to rethink how we divide up the sectors. I think our old ideas of statutory organisations, voluntary organisations and businesses are redundant. We need to think much more creatively about forms of organisation that are values-led." See, there's that phrase again. It's hard not to see the wisdom in all of this, though. The business of raising cash for good causes is becoming ever more cut-throat and media-savvy. Understanding and responding to that is a task that will test any, ahem, values-led organisation over the next few years. The Victorian ideal of charity is changing with every passing year. Let's hope the sector can mutate and survive, for all our sakes. Make A Sea Change With GROWN! True insight into the damage we're doing to the environment comes from those that can see it up close and personal. The surfer community has long been at the forefront of the movement to do something about the man-made waste on our coastlines. Groups like Surfers Against Sewage have been proactive at keeping the poor state of some of our beaches in the news. Now, a new bunch of surfy types are aiming to raise awareness with a fresh range of beautifully designed t-shirts. GROWN are three Irish guys with a passion for the waves, and a clear idea of how they can use ethical fashion to get their message of Sea Change across. Luckily, their extensive research paid off, and the GROWN boys have found a supplier that uses renewable energy and pays their workers fairly. For Stephen, though, anything less simply wouldn't do. “...every brand should be doing this, it should be bog standard”. GROWN's straightforward attitude, mixed with a clear passion for sending out the message makes them a refreshing new voice in sustainable fashion. Their debut campaign, Sea Change, is already making waves. Surf's up! For more on the clothes and the mission, check out the GROWN website. Sustainability is about making things last. You'd think that would be a no-brainer. Yet there are many voices out there that would like to persuade us sustainable fashion is still all about buying new things. It's a nonsensical argument. Why would you throw a jacket out because the zip doesn't work, when you can easily get it replaced or repaired? My home town of Reading has seen two independent tailors set up within five minutes of each other. Both are doing a roaring trade. It seems like we do understand the notion of sustainability. It's sad that we even have to outsource simple repair work, though. It isn't that long ago that most families had someone that knew how to use a needle and thread. These are essential life skills that seem to have been forgotten over the course of just a generation. Fortunately, there are people willing and ready to teach us the error of our ways. In a video put together by the excellent folk at Fashion Revolution, knitting guru Katie Jones takes us through the easy ways we can repair or retask tired garments and bring them back out from the back of the wardrobe. It's an inspiring watch, and Katie's enthusiasm is clear. Fast fashion: it's so much a part of our 'buy cheaply and often' culture that we don't even stop to think about it. The whole notion of 'buy one, get one free' has encouraged us to spend on items we don't even need, satisfied that we've got a bargain. This conspicuous consumption is a huge issue and it's not getting better anytime soon. If anything, innovation in prototyping and digital ordering is leading us further down the slope. The latest idea, launched at this season's fashion shows, is 'see now, buy now'. You don't have to wait for the newest designs to roll out to the shops. If you like what you see on the catwalks, you can order it and get it delivered there and then. This, of course, puts enormous pressure on already maxed-out fashion factories, who are now expected to deliver just-in-time orders of new designs at an acceptable level of finish. What does this mean for the workers who are at the sharp end of the deal–who have to make the clothes in the first place? Sadly, many people simply can't see past the allure of instant gratification. Emma Watson, who has become something of a spokesperson for sustainability, recently launched a range of capsule clothing. That range was available on launch, and the publicity she gained from a big wave of press coverage ensured a quick sellout. This is exactly the problem that workers like Nazma have with western fashion, and it's certain Watson's suppliers would have been under intense pressure to deliver on time and budget. This is hardly a good example for a public figure who claims to care about worker's rights. Our View: Nazma is a figure whose bravery and tenacity in the face of overwhelming odds should be celebrated. She's absolutely right about how our greed for more stuff, right now, has cheapened and marginalised the people who work so hard to deliver the clothes we covet so badly, and need so little. Emma Watson, sadly, is sending the wrong message to her legions of fans. The last thing we need is another collection of celebrity-endorsed clothing that we can buy without thinking about it. We looked earlier in the year about the likely impact of Brexit on some of The View's key areas of interest. The general mood was bleak but the one main conclusion was: it's too early to say. For the most part, that's still the case. The trigger-pull of Article 50 is unlikely to be invoked before next spring, which is when the real work starts. But for charities, a new report gives a clearer idea of the role they are to play in this uncertain new Britain. The Charities Aid Foundation has spoken to politicians from all hues of the political spectrum and a broad swathe of the public to get a better idea of the general mood and how the Third Sector could fit into that. The report that's been generated from all that work, A Stronger Britain: How can Charities build post-Brexit Britain? is a fascinating and surprisingly hopeful read. There are two main points to take from this new work. Firstly, that Brexit has sparked a new sense of activism and, as a byproduct, folks feel much more inclined to volunteer. In fact, studies show that nine million people are more likely to give up some time for a cause than before the June 23rd vote. They feel the need to channel their sense of anger and hopelessness into something more positive. The sense of division in the nation at the moment is almost palpable. Families have turned against each other in the aftermath of the vote, and communities are split in twain. But charities, with their real connection to these communities, are in a unique position to help and begin healing the rifts. Again, the study shows that people view the Third Sector much more positively in this regard than in any other way of providing support to neighbourhoods in need. "Charities are born of their communities and are often best placed to see community division first hand. And the public see a legitimate role for charities to speak up on behalf of those they support. This is why we are calling on local and central government to commission charities to monitor levels of community cohesion, and threat, and to use the proposed British bill of rights to protect the freedom of charities to speak on behalf of their beneficiaries." In other words, there's a place for charities to become a central part of the mediation process, making sure that ordinary people are not left behind in the race to Brexit. The influence and expertise the Third Sector can bring should not be ignored or minimised. There is an enormously positive and important role for charities in post-Brexit Britain. Our oceans and countrysides are littered with the detritus of our takeaway age. Discarded drinks cans, old gum, cigarette stubs and of course, plastic. Recent research has shown that the man-created island of waste floating in the Pacific is even larger than we originally thought. It seems like we're the victims of our own thoughtlessness, and there's precious little we can do to stem the tide. Except we can, and we are, and it's taken one simple step to start rolling things in the right direction. Namely, the 5p charge on plastic bags to consumers that launched in the UK earlier this year. Figures have recently been revealed on the first six months of the charge being put in place. The results are remarkable. It's astonishing that one tiny charge has brought about such a rapid sea change (sorry) in our behaviour, and there are added benefits too. That 5p levy on bags has earned charities nearly £30million in donations from supermarkets over the past six months–a vital fresh source of income as people are giving less directly to good causes. There's also been a boom in the market for sturdy multi-use bags. Made out of materials like hemp and printed with ethically-produced dyes, these are eminently sustainable items that will last for dozens of shopping trips. But why stop there? If such a simple step can have such a massive change, then it makes sense to carry on and levy micro-charges on other major causes of man-made waste, like one-use coffee cups. There's definite interest in a change. Starbucks already offer a discount if you bring in your own cup, and helpfully sell reusable mugs in store. I'm old enough to remember when glass bottles had a deposit on them and could be returned to stores to get that money back. This is an idea that bears resurrecting–in fact, it's still a thing in dozens of European countries. The whole process could even be modernised with reverse vending machines that will take your glass and aluminium and pay you back for them. The raging success of the plastic bag charge should be a kick-start for a modern, pragmatic approach to recycling that uses a simple psychological trick to get us to do the right thing. Sadly, the government environmental body DEFRA at the moment is not in such a keen mood, preferring to see if the figures are a start-up bump or will translate into further success. But for many of us who use the UKs beaches and rural areas regularly, the benefits are already becoming clearer. For once, we're seeing a win-win for the environment that also benefits people in need. That's a very unexpected item in the bagging area, right? One of the big horror events of the year is set to be the arrival in cinemas of The Girl With All The Gifts. Starring Gemma Arterton, Glenn Close and Paddy Considene, the movie is a twisty, genre-expanding take on the zombie apocalypse. It features break-out roles for several young actors, including Sennia Nenua as the titular Girl. A small but significant role is played by Walsall-born Joel Sheldon, as T-shirt Boy. An attendee of the Pauline Quirk Academy, he was chosen from a long-list of five hundred to play a zombie child whose actions cause a pivotal shift in the film's events. Here's why we're talking about a zombie film in an ethical fashion and charity blog: when he was seven, Joel was diagnosed with a brain tumour. He was supported through extensive chemo- and radiotherapy by the good folk at CLIC Sargent, the charity for young people with cancer. The procedures were successful, and he was able to chase his dream of movie stardom–a dream that has come one step closer with his role in The Girl With All The Gifts. Ironically, Joel will be unable to see the film in cinemas. It's 15-rated, so he's too young! Stories like Joel's show just how important the work CLIC Sargent do can be, and how their support can help kids with cancer to not just survive, but beat the odds and follow their dreams. The Girl With All The Gifts is in cinemas now. How Asos Treats Its Workers–And Why You Should Care. Ten years ago, the notion of mail order was deeply untrendy. It involved the use of a catalogue as thick as a phone directory, and clothing lines that never came close to being on trend. In the Age Of Amazon, of course, everything has changed. Small ethical retailers are able to advertise and sell their wares to customers across the globe. A world of fashion is at our fingertips. Choice and price has never been better. But there's a darker side to the retail revolution. Slaking our thirst for online purchases has meant the growth of gigantic fulfilment centres where the items we order are picked, packed and despatched. Fast turnaround of orders means tight picking targets. For the people that work in these centres, that can mean a working day where breaks are discouraged, and any infraction can lead to a loss of earnings. Buzzfeed News has just released a scathing exposé of the fulfilment centre for online fashion giant Asos, based in Grimethorpe, Yorkshire. It reveals a world where deadlines are the only metric for success, and that workers that cannot maintain the blistering pace find themselves 'deselected' for shifts. In an economic climate where Asos is the only game in Grimethorpe, that can mean facing a very uncertain future. Picking targets can be as high as 160 items an hour, from a warehouse that has nearly 26 miles of walkways. Failure to meet those targets will frequently see workers pulled up to management offices to explain themselves. If that target line slips further, supervisors discourage staff from taking tea or toilet breaks. The uncertainty of the so-called 'flex' system run by Transline, who employ agency workers for the centre, is another source of tension. Asos employees can be stood down or expected to work overtime at very short notice. Workers claim it's a one-way street–many have 40 hours or more overtime in the bank, with no sign of it being reimbursed either in payment or time off in lieu. Asos argue that they have invested massively in an area that has suffered from unemployment following the closure of the Grimethorpe pits in the early 90s. They also shrug off complaints as coming from a tiny percentage of disaffected staff. Our View: every Christmas we see horror stories coming from the huge fulfilment centres that feed online retail giants like Amazon. We know that staff are treated without respect, and expected to work long but uncertain hours for little more than minimum wage. But it's a complex situation. As consumers, we blithely expect items to come through the door with no more effort than the poke at a tablet screen. The power of a piece like the Buzzfeed News exposé, which I urge you all to read, is that it makes us think a little about the complex systems that go into something that we all take for granted. Above all, it gives us a reason to care. We simply can't use the excuse that worker abuse means nothing to us for cultural reasons, or that it's so far away. The poor treatment of ASOS employees is right here, right now. And we need to give a damn about that. Rehabilitation. It's a word that gets used a lot around the world's prison population. Locking someone up because they have committed a crime should not, in the vast majority of cases, be about punishment. Instead, it can be an opportunity to set a life gone off the rails back on track, to get an education or a skill that will keep you straight when the jail door closes behind you. Unfortunately, those chances can be thin on the ground. Prison labour is unskilled, extremely poorly paid and offers few chances to make a genuine change. The sort of situation, in other words, that we would be campaigning against if it was happening on the factory floor on the other side of the prison gates. But, as an inspiring piece in The Guardian points out, there are outliers in prison labour that are starting to make a difference. Fashion is going to jail, and it's bringing a chance to start again with it. Social enterprises like Fine Cell Work in the UK are working with prisoners to learn embroidery skills. The pieces that they make have been exhibited in the V&A, and sold on to conscious designers like Pier favourite Stella McCartney. Working in 29 jails across the country, Fine Cell Work are offering a real opportunity–even if the pay isn't quite what you'd expect from skilled labour. And there's the point to the whole enterprise. Prisoners who are given a chance to learn a new trade or skill are far less likely to slip back into old ways when they leave. Support and encouragement in a positive direction is vital in a successful rehabilitation programme. Ventures like Prison Arts and Fine Cell Work are making a difference, ensuring that a spell in the slammer doesn't lead to a wasted life. We know that ocean plastic is a big problem. Sea creatures from fish all the way up to mammals like whales and dolphins suffer as they ingest or are entangled in our throwaways. Will the giant island of floating junk in the Pacific become a man-made monument to our wasteful ways? As regular readers of the blog will know, there's another side to this story. Forward-thinking entrepreneurs are looking at the huge amount of plastics in our ocean as an opportunity rather than a problem. They want to harvest the stuff and make new items out of it. One of the front runners in this race to the new frontier is Italian company Aquafil. For the last forty years, they have been leaders in nylon production. But you can't lead by looking backwards. The board of Aquafil have spent the last five years putting together a plan that could not just reinvigorate the company, but show the way to a holy grail of sustainable fashion. In association with a team of university researchers and scientists, Aquafil have found a way to use nylon as the product of a closed-loop system. For late-comers, that's a process where the raw materials used to make something can be broken back down and reused. The process initially used old carpets, but the Aquafil team found that discarded fishing nets would work perfectly. Along with other examples of industrial waste and fabric scraps, the process 'unzips' the important Nylon-6 molecules, enabling the production of brand new nylon that can be used in exactly the same way as fresh product. Better yet, this new yarn uses over 50% less energy and carbon dioxide emissions than polymers made using traditional methods. The best bit? This is no pipe-dream or proof of concept. Aquafil fibre is already being used by brands like Levi's and Speedo. Scaling up the process can only get us closer to the ideal of a truly closed-loop system. More to the point, it also transforms waste like ocean plastic into a desirable commodity. I would not be surprised if an enterprising company is already setting up expeditions to go fishing for old nets and waste. It's estimated that there are 640,000 tons of fishing plastic discards up for grabs. There's gold in them there oceans. For more, check out this Magnifeco story. In a move that has wrong-footed many commentators on the fashion scene, a new player has quietly launched a collection of sustainable clothing. New to the ethical scene, that is. This new player is possibly fast fashion's biggest name–Zara. The #JoinLife Collection is a capsule range of sustainable clothes made from organic cotton, Tencel and recycled wool. The garments are stylish and comfortable, with a loose, eco-hippy vibe. Even the boxes that the clothes are shipped in comes from recycled material. Zara have also announced a more wide-ranging ethical plan, which includes in-store recycling bins, eco-efficient stores and a general move towards a corporate policy that supports sustainable development and responsible worker management. If this sounds at all familiar, you're not the only one to notice. The move seems to have come straight from H&M's playbook, whose Conscious Collection launch in 2012 was swiftly followed by a land-grab on the ethical side of high street fashion. Many observers still view this stance as green-washing, citing the limited nature of ethically-sourced garments in H&Ms range. Is this new move by Zara just an attempt to steal a little of their Swedish competitors thunder? Perhaps. But we should also note that parent company Inditex's Annual Report, released early this year, made a lot of noise about sustainable development. It's possible that the #JoinLife Collection is just the first step on a path to a more responsible fashion industry. Because let's be clear–Inditex are one of the biggest players in the market, and if they're starting to take ethical fashion seriously, then everyone is going to pay attention. Over the last couple of weeks, a strange new item has been appearing in the wallets and purses of the nation. The first major innovation to UK currency in decades has given us the plastic five pound note. The benefits of moving from paper to plastic when it comes to a hard-used item like the fiver are pretty obvious. It's much more hard-wearing, so it can stay in circulation for longer. It's waterproof, which is a relief for those of us who don't check their pockets before putting their clothes in the wash. Most importantly, it's much more difficult to forge, requiring a highly complex set of processes to manufacture. Our Aussie cousins have been using plastic currency for years now, so the technology has been successfully field-tested. Apart from rampant nostalgia, there's really no reason to see the disappearance of the paper fiver as anything but a great step forwards. But what do you do with your first fiver? Surely this is an occasion that should be marked with a little celebration. Does it go towards a breakfast treat? Perhaps a glass of prosecco to toast the future? Well, a lot of people are doing the right thing and donating their first fiver to charity. Social media, using the hashtag #firstfiver, has been all over it. Honestly, it seems like a lovely idea to me. A fiver is the perfect amount for a charity gift: not too little, not too much. It's a gesture, but one with positive benefits. So why not make that first plastic note do something worthwhile? I'm sure you all have a good cause that could benefit, but if not, just do a search on #firstfiver and you'll find plenty of ideas. Personally, I haven't been given one yet. But once I do, I know what I'll be doing with it. As the autumn edition of London Fashion Week rolls around, so too does the Green Carpet Challenge. Launching in 2013, the annual event is designed to show how sustainable fashion can hold its own on the red carpet. This year's event, sponsored by BAFTA, was the most glamorous yet, with a ton of fashion icons and movie stars showing up at British film's Piccadilly HQ. Host and queen of the scene Lilia Firth welcomed guests in a stunning William Vintage gown, along with her husband, actor Colin Firth. And what a rollcall! Victoria Beckham and Vogue editor Anna Wintour hoofed it to London fresh from New York Fashion Week, while Keira Knightley and Helena Bonham Carter brought a shot of Hollywood sunshine to the proceedings. Keira teamed her cream dress with a fairly-mined gold ring from Chopard's Green Carpet Collection. “It has been a difficult path full of surprises; but thanks to commitment and expertise we are able to offer our customers a product which is environmentally conscious and aesthetically impeccable." The Green Carpet Challenge event, which also included a screening of The Last Monday In May, is another step up towards the influence of ethical fashion on the mainstream. It attracted gushing headlines across the planet, and highlighted how Livia and her company Eco-Age are luring in an audience with a little dose of glamour. For more, and to check out a slideshow of images from the night, do slide over to Vogue, darling. We talk a lot about 'conscious consumerism'–the idea that we can be better citizens to the planet simply by shopping in a more thoughtful and considered way. Which is a great idea in theory, but somehow loses something in practice. If it means a hit to our weekly budget, or that we have to go out of our way to find ethical or sustainable products, then we are much less likely to go down the conscious route. But the boom in online shopping has forced something of a step-change, and has made the idea of conscious consumerism a lot more realistic for many of us. Much apart from the way that we can now connect with and buy from our favourite ethical retailers, there is a push towards charity giving as you shop. Sites like QuickQuid have been a savvy shopper favourite for years. They work as a portal to the big online retailers, and by signing up you accrue points that mean you save money or snag rewards. By attracting more shoppers, the portals earn commission which allows them to make money and pass the savings on to you. Simple, eh? Now there's Give As You Live. It works in exactly the same way as QuickQuid, but instead of rewards you earn money for your favourite charities. Sign up is simple and straightforward, and you're not limited to second-rate retailers. You can even do your weekly food shop. Worried that your charity might not be supported? There are currently 200,000 good causes to choose from, from well-known names like the Big issue Foundation all the way to local churches and social clubs. You can always reach out and persuade your charity to sign up, of course! Give As You Live are clear about how much you'll earn for your cause: percentages depend on the charity and the retailer. Nothing's hidden, and there's a dedicated support team ready to help. They've raised over £7.5million since starting in 2010, and have won a stack of awards for the good work they've done for the sector. I honk on about finding clever new ways for charities to raise their fundraising game. This has to be one of the smartest. Our View: Give As You Live seems like a no-brainer to us. An easy and transparent way to earn cash for charities while carrying on the retail adventures that you'd do online anyway. It costs you nothing but a couple of extra clicks. If you're already used to doing things the QuickQuid way, there's no learning curve at all. Check them out, and see if you can shunt some money towards your favourite good cause. The tone of our last couple of posts has been a little... well, bleak, I guess. It's hard to be light-hearted when the world seems to be collapsing around your ears. The thing is, though, a lot of that attitude can simply be down to viewpoint. Shift that and things can take on a different, more hopeful sheen. The reportage that is starting to build around the parlours state of fast fashion is good news for one reason. In order to solve a problem, you first have to acknowledge that the problem exists. And all of a sudden, the public has become aware of the massive issues surrounding the way we make and consume mass market fashion. As Orsola De Castro notes in a great article for The Huffington Post, the situation is comparable to the food industry. There have been huge changes over the past twenty years as we have woken up to the fact that what the big food business wants is not that good for us. Sure, there's still a long way to go, but legislation and public will is moving us slowly towards a more sustainable model. There's a sense within the fashion industry itself that things need to change. As climate change becomes a clear and present danger, old methods can no longer be considered. Sure, we can sneer at the limited runs of so-called sustainable clothing from high street behemoths, or their tiny percentage of ranges shifted over to organic methods. But at the same time they are beginning to adopt practices and procedures that ethical superstars like Patagonia and Nudie Jeans have had at the heart of their business since the beginning. You have to start somewhere. The simple fact is that you can't turn a juggernaut around on a dime. These things do take time. And there are increasingly encouraging signs of change, particularly when it comes to worker relationships with the big brands. No less an entity than Gap, long resistant to to any sort of supply-chain transparency, announced last week that they would be opening their records as to which factories they use in developing countries and markets. This is a huge step-change for a company who have lost a lot of good will for their stance on, for example, compensation for Rana Plaza families. Now, you could argue that this is simply a PR exercise to put a bit of shine back on a tarnished public image. Or, you could view it as the first step in the right direction for an industry that has long been walking on a dark and dirty road. Either way, the end result is a positive one. If the destination is worth getting to, does it matter how you make the journey? Look, this post is a bit of a meander, I know. But it's really important to try and hold onto a sense of perspective in an area where the situation can change very quickly. The View From The Pier can sometimes be foggy and hard to see clearly. But we do our best to give you a reasonably balanced idea of what's going on. There is despair, but there's also hope. We need to hang onto that. As more and more mainstream publications are noticing the big problems with fast fashion, we're seeing some heavyweight journalism pointed at the sector. And worryingly, the news is worse than we thought. As a forensic investigation from Newsweek makes clear, the model that most clothes retailers have adopted is leading us into environmental disaster. The problem is that fast fashion is all about cheap, low-quality clothes, and lots of them. Inditex, the business behind well-known names like Zara, refreshes their retail line not seasonally, not monthly, but weekly. That means a lot of clothing that simply isn't built to last. Worse, the clothing is of such poor quality that goodwill and second-hand stores simply won't take them. They're even being rejected by charities that re-route second hand clothes to the needy in third-world countries. The items are simply not fit for purpose. Indeed, some African countries are now calling for a ban on imported second-hand clothes. According to recent figures, over 80% of unwanted clothes will go into the incinerator or landfill, with the associated environmental impact. That poor quality even impacts the traditional route for low-end textiles–down-cycling for industrial use like wiping rags and insulation. Clothes made from this fabric falls apart much more easily. What happens when they can't be used anymore? You guessed it... Back to landfill. You can't even safely compost modern clothing, even if they're made from modern fibres. These items go through so many industrial processes, from bleaching to dyeing, that they're loaded with toxins–which again easily leach into groundwater if a landfill has been improperly sealed, or are released into the air when burned. The numbers of unwanted clothes going to waste is utterly mind boggling. New York City alone sends 200,000 tons of textile waste to the tip every year. Any recycling programme can only nip the very tip of that away. And most municipal collection programmes are under-promoted and hardly used. The inference is clear: we're drowning in low-cost, low-quality clothing that doesn't last and clogs up the environment. The brands that have adopted this unsustainable approach, though, don't want us to stop. Instead, they're using limited edition ranges of organic clothing or recycling events to persuade us into believing that something is being done. It's not enough, and everyone knows it. There are green shoots of change. Both H&M and Levi's have trialled jeans that have a much higher than average percentage of recycled cotton. And urgent research is being done into the holy grail of sustainable fashion: cradle-to-cradle recycling. But nothing is going to happen quickly. Articles like the Newsweek expose are at least showing just how much trouble we're in. The big question is whether we can save ourselves before the tide of toxic landfill clothing swamps us for good. Back in May we talked about a Vice piece on the conditions faced by garment workers in Cambodia. Now Fashion Revolution have picked up the story, and the truth about what these people face as part of their everyday working lives is becoming clear. To recap on what we already know: Cambodian workers in the garment trade often face a four-hour daily commute, standing up in the backs of cattle trucks. But the workplace itself is no golden paradise. The factories resemble prisons, with watchtowers, barbed wire and frequently, security details made up from armed police officers. These officers are often part of the excessive response to peaceful worker protests. One demonstration as part of a campaign to pay a minimum wage in 2014 led to four deaths. Attempts at unionisation are met with intimidation or even arrest. Conditions in the factories are frankly inhumane. Without air conditioning, they soon become ovens, and work with dangerous, insecurely guarded machinery is the norm. With mandatory overtime, insistence on double shifts and insufficient time for breaks, it's not surprising that there are accidents. Yet managers will insist that these incidents are downplayed or even ignored. Nothing can get in the way of the push for profit, and people are just another cog in the machine. “I worked from July to September of 2014, during the summer holidays at university. The name of the factory is TaiEasy, located in Krakor district, Pursat province. I worked in the “product safety” department, verifying that the machines were in a good condition, but also doing administrative work. I earned $115 per month, and the company additionally provided us with 5kg of rice. My schedule at work was from Monday to Saturday from 7am to 11:45am, and from 12:45pm to 4pm. However, except for Saturdays, we were asked to do overtime until 6pm or 9pm, depending on the day. And we would not get paid extra. What I could not understand is why the salary of my Vietnamese or Filipinoe colleagues was higher, even double or triple, than for us Cambodians. Most of the time it was us teaching them how to do their tasks when they came in as newcomers. And apart from the salaries, another difference between us Cambodians and the others were the holidays: Cambodians did not have any, just for the Khmer New Year and other national holidays. The other workers from other nationalities did have a few days of holidays, I can’t say how many days though. The whole article by Idair Espinosa is well worth a read. It'll give you an idea as to exactly what fast fashion means to the people who make the cheap clothes we have come to see as normal: exploitation, humiliation and potential injury or even death. Is a cheap top really worth that? In what seems to be turning into the Start-up Of The Week slot, let's take a look at a new initiative that's seeking to freshen up the image of sustainable fashion. Birdsong aims to be different in every way. The brand has built a network of artisans from across the globe that have one thing in common: they're groups of women who are using their skills to fight for a better way of life. Birdsong currently work with 17 women’s organisations, reaching 483 female makers on the margins of society. This includes elderly, migrant and low income background women, women recovering from addictions, single mums, and survivors of human trafficking who are finding a new trade as goldsmiths. By teaming these women with contemporary designers, Birdsong are able to produce modern clothing with a story, that helps to give a life and purpose back to the most down-trodden. But don't assume this is just a charity exercise. The items that Birdsong sell are designed to transcend the seasonal trap, and built to last for years. Using short lead times and limited runs, they can move quickly, respond to customer demand and still keep costs to a realistic level. The Birdsong ethos even extends to the marketing. Their mantra is 'no Sweatshop, No Photoshop.' Instead of the usual over-glossy shoots common to the industry, Birdsong use models they find on the street, in shoot them in a natural way that includes no re-touching in post. It's all about celebrating the natural beauty all around us, and walking away from toxic, unreachable images that tell girls that they can never be pretty enough. Birdsong's online platform has helped them to reach a solid base of fans, including celebrities like Bake-Off's Ruby Tandoh. But there's always more to be done. Founders Sophie and Sarah are fundraising to launch a pop-up shop, showcasing the quality of Birdsong's clothes. The good news is that they're already nearly two-thirds of the way there. Why not take a look, and see if you can help spread the word? In a sidebar, I'm happy to note that this entry marks our 700th blogpost on The View From The Pier. We'd like to thank everyone that reads and helps to share our work. It's very much appreciated.